The improper disposal of waste is one of the fastest growing risks to our planet and way of life. Rotting food leads to increases in methane gasses as the food decomposes in landfills. To address this, the City of Cape Town plans to start banning wet waste from its landfills from 2022. The Waste Transformers from the Netherlands and South Africa’s own JSE-listed international property company Growthpoint Properties have united to help take on this challenge. 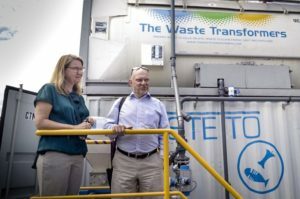 They are leveraging end-of-pipeline food waste from shopping malls and adopting a de-centralised approach to organic waste. An on-site, anaerobic digester has been installed at Growthpoint’s N1 City Mall in Cape Town, which is processing the waste from the mall to generate clean methane. This methane is consumed by an internal combustion engine to produce green electricity and hot water for the shopping centre. A fertiliser is also created, which will be used for the mall’s gardens. It is an on-site, smart, green, transportation-free approach to realising zero-landfill that makes sense. 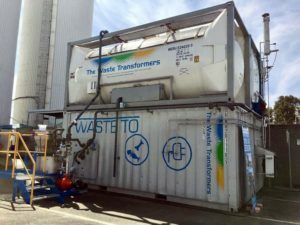 The Waste Transformers is a waste solution provider specialised in converting organic waste streams into energy while simultaneously transforming waste into new products. 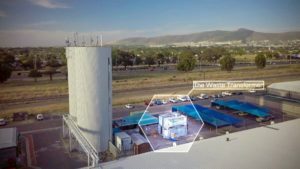 The Waste Transformers are specialised in a smart, high-impact approach to resource recovery and energy production that aims to power South Africa’s growth with good, green energy, generated locally, while simultaneously recovering the assets in waste. This is great, but can we also focus on minimising organic waste in the first place such as food waste, and if the food is still edible redistribute it for human consumption.